Mr. Driller: Drill Till You Drop was delisted no later than March 27th, 2019. This is the earliest date that a Google Cache archive is available and shows the title was already delisted. By March 29th, 2019 at least three other Namco titles were removed from the PlayStation Store. All four related titles were submitted to the site by an anonymous source within a day of each other. The reason for the delistings is uncertain. 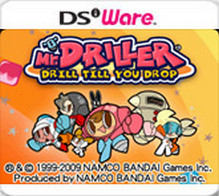 On Nintendo’s platforms Mr. Driller: Drill Till You Drop was Namco’s only DSiWare release outside of Japan so a precedent is hard to identify. On the PlayStation Store, several “PSOne Classics” are alternately published by Namco themselves and Sony Interactive Entertainment. Other “PSOne Classics” from Namco remain available as published by Sony.